Conditioning: Simply conditioning the ends is as good as not conditioning your hair. There is a common notion of applying conditioner only to the lower half of the hair. 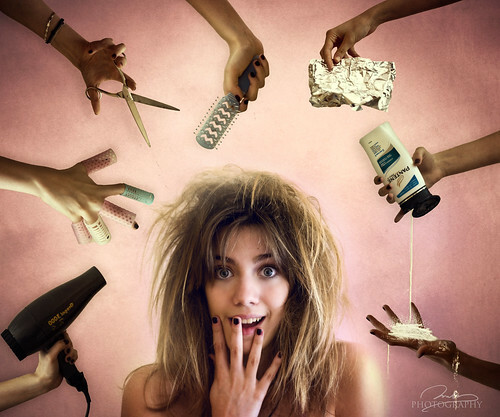 This should be avoided as it can make your hair even more prone to breakage. The ideal solution is to use a good conditioner from root to the tips. Thermal protectors: Most of the women use blow dryers or straightners without using heat protective spray for the hair. This can make the hair appear dry and brittle as too much heat can deprive your hair of moisture. Using an insulator can act as a shield for your hair cuticles and protect your hair from damage. Towel-drying: Most of us use towels very rashly to dry our hair by rubbing them frantically. This will not only cause breakage but also damage the hair cuticles and cause split ends. The solution is to avoid rubbing your hair and draining out the excess water by gently using a towel. Detangling the locks: This is one of the most common mistakes that women make. While detangling our hair, we sometimes tend to become inpatient and run the brush frantically to detangle the hair. This will simply cause breakage and you will simply find the entangled locks in your comb. To avoid this, use a wide tooth comb and run it gently through your hair. Haircut: Generally, most of the women end up getting the wrong haircut that doesn’t suit the kind of face. You certainly wouldn’t want to sport a hairstyle which would make you look 10 years older. Hair color: Make sure that you use the hair color that suits your complexion. If you have a very fair complexion, you should certainly avoid light blond shades. Perhaps, opting for darker tones will enhance your features and make you stand out. Bangs: Bangs are in trend. But the straight bangs might not necessarily suit you as they draw attention to your features. You can opt for side swept bangs if straight bangs don’t suit you well. Parting: Hair parting is also extremely important when you are styling your hair. You should part your hair as per the shape of your face. If you have a heart shape, you should do away with middle parting and rather opt for anything but center parting. People with round face can opt for side parting while center parting suits the best to the people with square shaped face. Keeping the above tips in mind, if you have already decided to get a makeover, then perhaps you can check out VoucherBin.co.uk for amazing discounts on wahanda.com, one of the best websites for your hair care needs. You can shop around for anything related to haircuts, hair coloring and other hair treatments on the website and you wouldn’t be disappointed. How to Get Perfect Curl for the Wedding Day?